When it comes to the installation of Portland Stone Steps, it’s only natural to worry about the time it will take and the cost it will incur. As industry leaders in Natural Stone, our primary focus is (and always has been) with our customers. With over 25 years in London, we always leave our customers with an elegant, inspired and inviting entrance way to return home to. Having Portland Stone Steps installed is as simple as choosing your materials and hiring us to complete the job. Installation can take as little as a few days and it will transform the entrance to your home into an elegant, up-market doorway that not only looks great – but also increases the value of your home in the long run! If you are living with rickety stairs, steps that are broken and smashed or paving stones worn thin by water damage and the passage of time then there really is no need to suffer. Our expedient service can come to your home, assess exactly what you need and give you a quote there and then. Our team of highly skilled masons will then work all the hours they can until the job is done. You see? Having those Portland Stone Steps installed really won’t be such a terrible inconvenience after all. If you already sport a fabulous set of steps but the years have not been kind to them – then look no further than our team! We are able to carry out any repairs on Portland Stone Steps that you might need taken care of. Although Portland Stone is long lasting and tough, sometimes accidents happen. We can be there to right the wrongs and put your stairs back together again. No job is too great or too small; not when the future of an elegantly crafted and well preserved stairway is involved! We can also supply the stone if you already have fitters! Even if you have already found someone else to fit your new set of Portland Stone steps – you can still hire us to supply the stone for the job. So if you are seeking to install, repair or simply source your new stairway then we can help you out! We have over 25 years of experiences in crafting hard wearing, long lasting and attractive stone steps. Our skilled masons are highly trained and more than qualified to carry out any and all the repairs, installations or maintenance issues you may require and, when you buy from us, you will always receive a friendly, secure service that you know you can depend on. 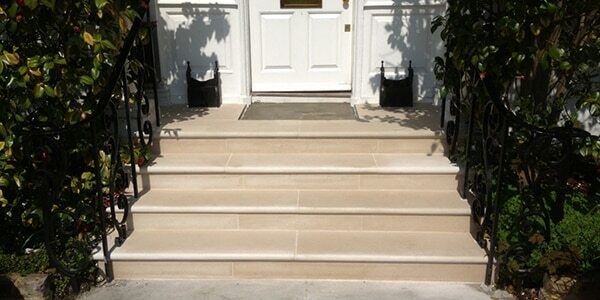 For Portland Stone Steps choose us… because there is very little we can’t do!